Plants of the genus Datura are in the Solanaceae or Nightshade Family. Vegetable gardeners recognize this family from the many familiar fruits that are cultivated for food crops. Among them are tomatoes, potatoes, peppers, tomatillos and eggplants. Tobacco and Belladonna are also in this family. The Nightshade family plants are rich in alkaloids, some of them narcotic and/or addictive such as: nicotine, scopolamine, and atropine. 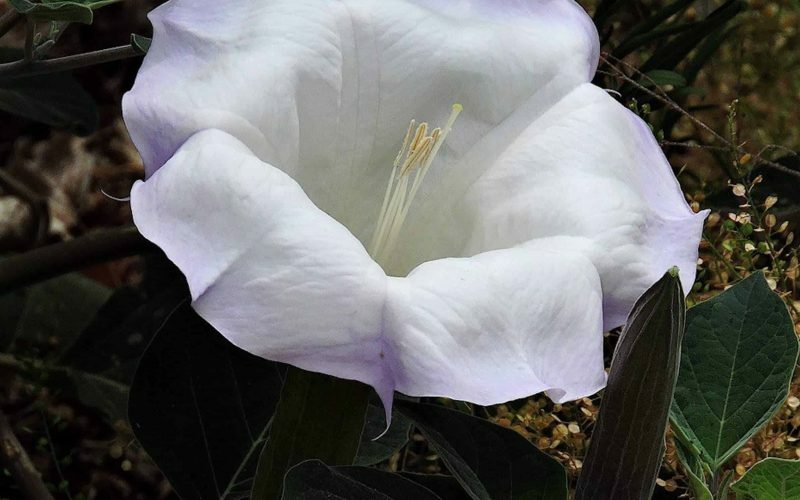 Showy flowers of Datura are easily recognizable. Extravagantly fragrant, white trumpet- shaped blooms, sometimes tinged with lavender around the outer lip. The flowers open at night and are visible early in the day. The flowers will often wilt in the heat or sun. 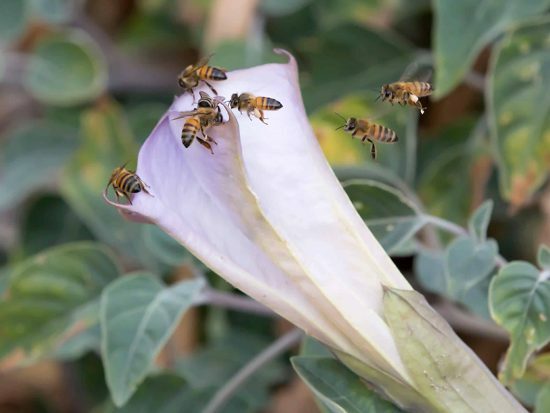 Hawkmoths are major pollinators, but Datura is visited by a plethora of other insects as well. Today on our first Tuesday Nature Walk of the season we noticed Katydid nymphs, Red Spider mites, spiders and bees on the flowers. The gray-green, simple, alternate leaves are velvety beneath. But I must caution ….. ALL parts of these plants are toxic. Though several sources quote the flowers, roots or leaves as being medicinal or narcotic, best not to touch or ingest, as reactions can range from skin irritation to vomiting and in extreme cases of ingestion … death. 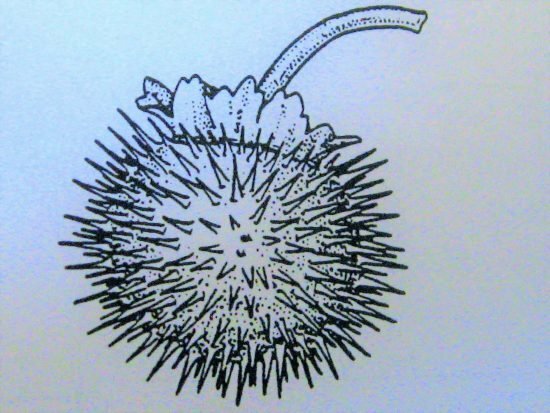 The fruit of Sacred Datura (“fruit: the thing with seeds in it”– A. Green) is a round, seeded pod and armed with dense, short, equal prickles. The pendant, dehiscent fruits contain 200-400 reniform (kidney-shaped) seeds. We have another species of Datura here in Sabino Canyon, Desert Thorn Apple (Datura discolor). 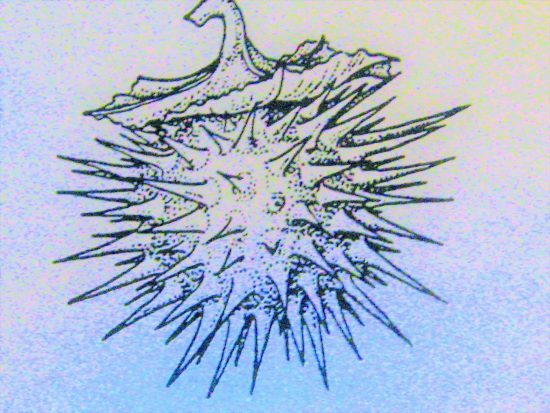 The fruits of the Thorn Apple are similar, except that it is armed with less dense, pointed, long spikes. Here’s an illustration of young, green fruit for comparison. The flowers of the Thorn Apple have purple streaks in the throat of the flower, and overall, it’s usually a smaller plant. I have seen it only occasionally at the entrance to Cholla Wash along the road to Bear Canyon from the Visitor’s Center.